I can hardly believe it’s been 5 years since Klaus was born. He was our happy midsize baby: 7 lbs, 15 oz, born in Mount Vernon, Washington. Every year has a lot of growth, but he has leaned out so much this last year and lost the last of the toddler look. He has a real penchant for adventures (as long as there are snacks), loves Pooh Bear and Calvin and Hobbes, and riding his new birthday bike. 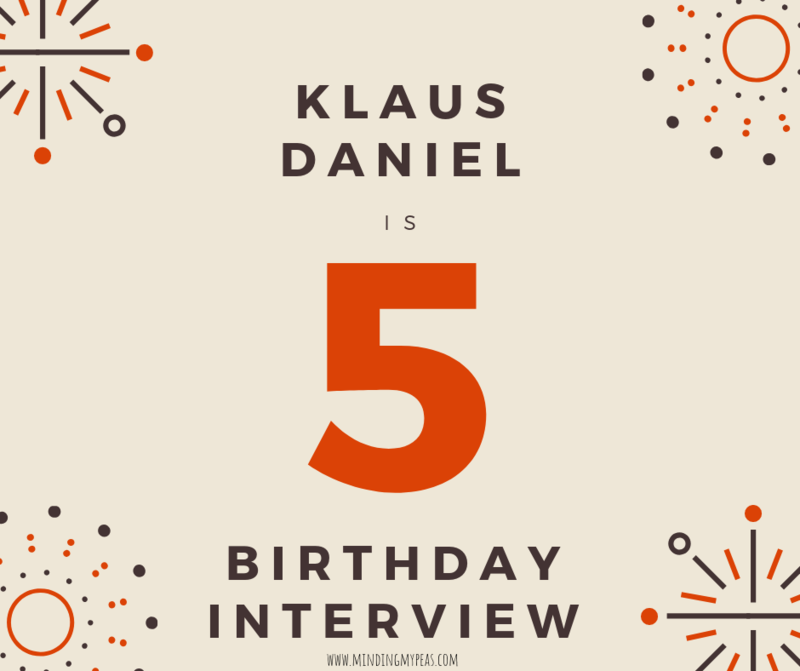 And now, for a peek inside the world of Klaus, I give you his birthday interview. What do you want to be when you grow up? I want to be a normal dad that goes diving and goes in the Navy just like my dad. I want to be just with a family I can see and hug and kiss when I grow up. I don’t want to be in space because I won’t see my mom and dad. What do you love to do with your family? Eat lunch! What do you like to do during the day? Play on my bike when it still has trainer wheels and when it doesn’t have trainer wheels. What is your favorite game to play? Motorcycle roll. It’s where two people drive the motorcycles on a train track to catch up with a train because it goes backwards. What clothes do you like? Black pants, white underwear, tee shirts, and good shoes and good socks. What is your favorite thing to do outside? Play. Is there anything else you’d like to tell me about yourself? I am Klaus and I have the cutest hair and I like how my knees are made. I just love this crazy, sweet, quirky boy! Priceless! Love “how my knees are made”!